Trying to understand the voluntary carbon markets but not sure where to begin? Ecosystem Marketplace and Business for Social Responsibility recently released the second edition of a free guide on the voluntary carbon markets that walks organizations through the key steps of offsetting emissions. Looking to slash your business’s greenhouse gas emissions but not sure where to begin? Ecosystem Marketplace and Business for Social Responsibility have issued a free guide to help you measure your emissions, reduce the ones you can, and offset the rest without falling into the trap of greenwash. 21 March 2008 | So, you want to “green” your business? Congratulations! Whether you’re doing it for your conscience, for your company’s image, or a little of both, we applaud the noble course you’ve embarked upon – and implore you to do it right. But where do you start? Do you replace all of your incandescent light bulbs with compact fluorescents? Do you retool your factory? Or do you double up on insulation, turn down the thermostat, and hold a cardigan contest? Or do you let your business run as it always has and just buy those voluntary carbon offsets that have been getting slammed in the press? From our perspective, offsets are a great tool, but not as a first resort – although buying them does focus attention on the cost of reduction and help you build a viable strategy. What’s more, bringing up the issue raises the most basic question of all: how do you measure your emissions in the first place? And once measured, how do you determine a strategy for reducing them? Specifically, where does reduction end and offsetting begin? And if your goal is PR, how do you communicate your achievement to the world at large without being accused of greenwash (assuming, of course, that you’ve made sure you aren’t guilty of the charge)? 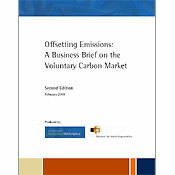 All of these questions are at least partially answered in Offsetting Emissions: a Business Brief on the Voluntary Carbon Markets (PDF), a complimentary tool published jointly last month by Ecosystem Marketplace and Business for Social Responsibility. The Brief is a no-nonsense, step-by-step guide to building a reduction strategy – from conception and quantification through implementation and marketing. It contains links to other tools available on the internet, and is probably best read after you’ve worked your way through the WWF’s slightly more accessible Making Sense of the Voluntary Carbon Market: a Comparison of Carbon Offset Standards, which we reviewed last week. For questions, please contact Steve Zwick, Managing Editor of Ecosystem Marketplace. He can be reached at: SZwick@ecosystemmarketplace.com.